Isaac Hayden is relishing facing Arsenal at the Emirates Stadium – having never been given a Premier League chance by the club. The midfielder joined Newcastle United in the summer of 2016 after spending a season on loan at Hull City. Isaac Hayden playing for Arsenal. Hayden’s only two appearances for Arsenal came in the League Cup. The 24-year-old left on “good terms”, having reluctantly accepted he needed to move to play regular first-team football. Hayden has been a fixture in Rafa Benitez’s midfield since the turn of the year, when United’s manager lost Jonjo Shelvey and Mohamed Diame to injury and Ki Sung-yueng to the Asian Cup. The former England Under-21 international has helped United move to within a win of Benitez’s 38-point target. And Hayden is keen help Newcastle secure Premier League safety – and show what he can do – in Monday night’s televised game at the Emirates Stadium. “Of course, it’s always a chance to go there and show what you can do,” said Hayden. “It’s always nice to go back to the Emirates. “It’s a bit different now, because they’ve changed the whole regime and I don’t know anybody at the club apart from one or two people. “It’ll be nice for family members to go to the game, but we’re just going to try to get the three points. If we get the three points, we’re on 38 points. Hayden found his route to the first team at Arsenal blocked by established international players. “When I left, it wasn’t on bad terms – it was on good terms,” said the Chelmsford-born player. “I was a young player who wanted to play more regularly and get more football. “Obviously, at a club like Arsenal, it’s very difficult, especially when they’re buying in £30million or £40million players. You kind of know it’s the time to go. Things could have worked out different for Hayden at Arsenal had it not been for a challenge from Mathieu Flamini in training. 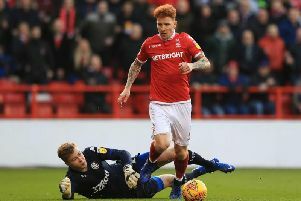 Hayden had been set for a Premier League chance at against Hull, but he suffered an ankle injury the day before the game after getting caught by Flamini in training and was out for 10 months. Asked if he felt hard done by, Hayden said: “No, not really. “The way I see it in football is that when you’re a young player coming through the youth academy system at any club, it’s all about your window of opportunity. “You look at Sean Longstaff here. Players got injured, he came in and took his opportunity and he showed what he’s capable of doing. He performed well on the Premier League stage consistently. “It was similar circumstances for me, but I was the other way round. I got an opportunity and I got injured and was out for 10 months and the opportunity had gone. “I don’t really dwell on it or think about it – that’s football. It’s part of your football journey. Meanwhile, Arsenal midfielder Granit Xhaka is doubtful for the game with abductor injury.